The Village Beacon Record, left, and The Village Times Herald published this piece in print on July 14, 2016. Brookhaven is laying the groundwork to make its beaches more accessible to residents. Town Supervisor Ed Romaine (R) and Councilwoman Jane Bonner (C-Rocky Point) announced new sand surfacing mats, called Mobi-Mats, at Cedar Beach West in Mount Sinai and West Meadow Beach in Stony Brook. 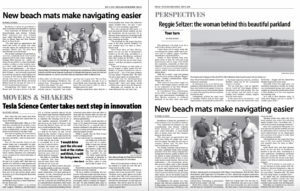 The nonslip, semi-rigid roll-up beach access mats, completely made from recycled polyester roll by New Jersey company Deschamps Mats Systems Inc., enable residents who are elderly or using wheelchairs, crutches, strollers or other mobility devices to more easily traverse sandy beaches. They are low maintenance — the tear-resistant, permeable structure allows sand to filter through — and are easily maintained by removing any excess sand buildup with a broom or leaf blower. Mobi-Mats have already been used at beaches in Nassau County, including Jones Beach, and by the Marine Corps for the past 20 years in vehicular beach landing operations. Accomplishing this project was easy, Bonner said. She saw a picture of the Mobi-Mats online over the winter and showed it to Parks Commissioner Ed Morris, who ordered them. “Everything in government should be that simple,” she said. 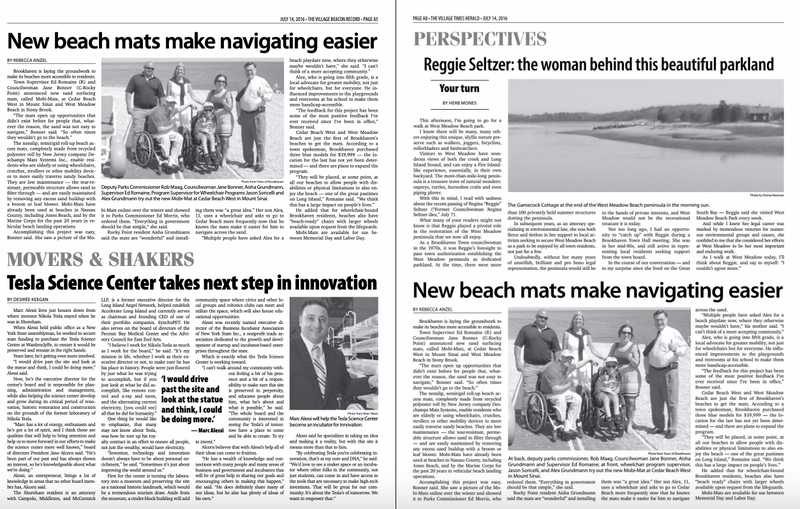 Rocky Point resident Aisha Grundmann said the mats are “wonderful” and installing them was “a great idea.” Her son Alex, 11, uses a wheelchair and asks to go to Cedar Beach more frequently now that he knows the mats make it easier for him to navigate across the sand. Alex, who is going into fifth grade, is a local advocate for greater mobility not just for wheelchairs, but for everyone. He influenced improvements to the playgrounds and restrooms at his school to make them more handicap-accessible. “The feedback for this project has been some of the most positive feedback I’ve ever received since I’ve been in office,” Bonner said. Cedar Beach West and West Meadow Beach are just the first of Brookhaven’s beaches to get the mats. According to a town spokesman, Brookhaven purchased three — and there are plans to expand the program. He added that for wheelchair-bound Brookhaven residents, beaches also have “beach-ready” chairs with larger wheels available upon request from the lifeguards. Mobi-Mats are available for use between Memorial Day and Labor Day. 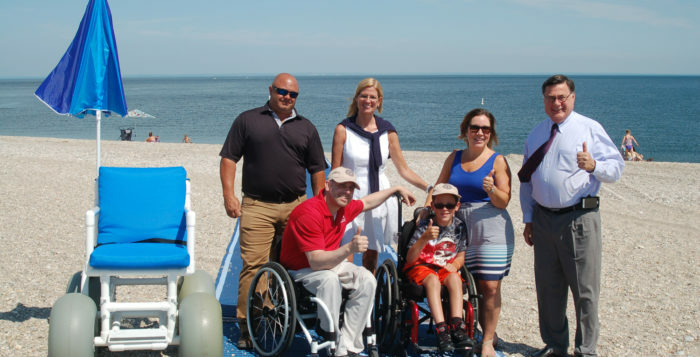 Deputy Parks Commissioner Rob Maag, Councilwoman Jane Bonner, Aisha Grundmann, Supervisor Ed Romaine Jason Soricelli, Program Supervisor for Wheelchair Programs, and Alex Grundmann, stand on a new Mobi-Mat at Cedar Beach West in Mount Sinai. Photo from Town of Brookhaven.